Facial clefts are formed when there is a lack of tissue in the lip area or the mouth and the tissues available does not properly join together. The most common clefts found are cleft lip and cleft palate. 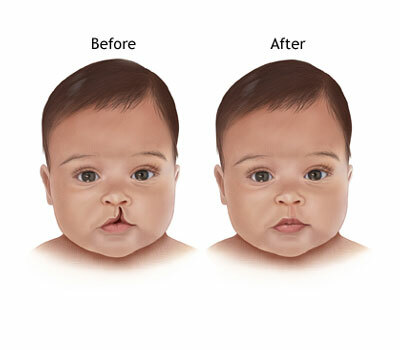 Cleft Lip: A cleft lip is a separation of two sides of the upper lip and appears as a narrow opening on the upper lip. This gap in the skin of the upper lip may extend beyond the base of the nose. Sometimes this may include the bones of the upper gum or jaw. Cleft Palate: A cleft palate is the opening in the roof of the mouth. It may involve the bony front portion (the hard palate) or the soft back portion of the roof of the mouth (the soft palate). A cleft lip and cleft palate can occur together or it is possible to have cleft palate without cleft lip or cleft lip without cleft palate because the lip and the palate develop separately. Also, cleft lip and cleft palate can occur on one side or both sides of the mouth. A cleft palate requires multiple surgeries over the course of 18 years and depending on the extent of the repair needed, a cleft lip may require one or two surgeries. JP Dentofacial and Implantology clinic offers advanced Cleft Palate treatment in Kerala. Dr Philip Mathew, renowned Oral and Maxillofacial Surgeon provides the best and advanced Lip Repair treatment in Kerala.